Begin your transformation journey to yoga health and wellness living with this holistic retreat with Christina in Maui, Hawaii. The retreat is open to new or established yoga practice, aspiring teachers, yoga teachers. Don’t miss out on an experience of a lifetime to enrich and deepen your study and practice. Accommodation will be provided where the retreat and yoga practice will be held. The retreat begins on Saturday and ends on Friday. Christina Martini is an international yoga teacher, educator, ashtanga practitioner. With more than 15 years of experience with yoga practices of Ashtanga Yoga and cancer nurse. Her passion to share the practice of Yoga to others is holistic, transforming and life-inspiring. She is a Licensed oncology-cancer Nurse, Certified Oncology Advocate and Navigator, Harold Freeman Institute. Health & Wellness Educator, Facilitator and Coach. A member to the American Holistic Nurses Association, American College of Lifetime Medicine, Holistic practices, E-RYT, YACEP, RYS Yoga Alliance. This retreat will take place in Maui, Hawaii. No meals are included. You will be provided with tea and coffee. A reservation requires a deposit of 47% of the total price. Christina Martini offers retreats for all to renew, refresh, restore, transform with Hatha,Vinyasa,Ashtanga,Mysore Yoga & breathing, meditation, and wellness. 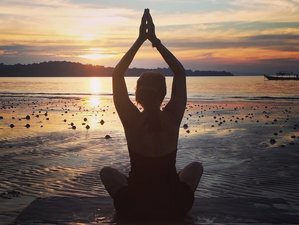 For this organizer you can guarantee your booking through BookYogaRetreats.com. All major credit cards supported. I would like to receive the BookYogaRetreats email newsletter, including special Yoga Retreats offers and giveaways. Show this Yoga Retreat to your friends.